Welcome to Captain-Crystal's Morning Star Balloon Co.
Captain-Crystal Stout brings a joy to ballooning with her expert skill as a pilot and her experiences as a story teller. She enjoys thinking outside the box to make your special occasion that much more enjoyable (got wings?). 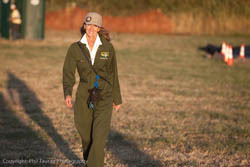 She is also a 3rd Generation hot air balloonist who has enjoyed flying in many parts of the world. Feel free to get to know Captain-Crystal more through her biography. The Morning Star Balloon Team (our Crew) are a fun and enthusiastic addition to the flight experience. Every year is an exciting year for us. Why? Because we get to fly balloons, meet new people, explore new skies, share wonderful memories, and teach adults to play like children. Captain-Crystal's Youtube videos or Morning Star Balloon Co's Facebook page. Email us to become a member of our Flight Team. We are always looking for quality people who want a fun weekend or hobby, willing to meet new and interesting people, and enjoy early morning adventures. We will put you on the roster and when we fly, will let you know. We would love to get you involved and best of all...IT'S FREE! Learn - Grow - Do! Be a balloonatic, increase your weather skills, get hands on hot air balloon training, socialize with others who enjoy flying. All this and more coming soon. Email us at "airboss@nwplace.com" to get on the list. Be sure to contact us if you want to enjoy any of the adventures offered with Captain-Crystal and Morning Star Balloon Co.